This is an important year for our Society, the fiftieth since it was founded, and hence this is the Golden Anniversary issue of The Rhododendron. There are three overseas articles: two with exciting and heartening news of the discovery of previously unknown populations of rhododendron species – in Sikkim, India R. niveum, and in Hubei Province, China R. simsii, in both cases of significant size. The third article has an absorbing discussion of the application of Phenology (study of the timing of recurring biological events through the seasons) to the monitoring of global warming indications, and an important role is proposed for rhododendrons as subjects for Phenological observations. We are most grateful again to Hemant Badola and Bahrat Pradhan (who contributed in 2009) for the R. niveum article, to Guan Kaiyun for the R. simsii one, and for the Phenology article Hemant Badola again. We also carry a short history of the Society and the National Rhododendron Gardens in Olinda, Victoria, which were established by the Society, through the labours of Society members, after successful advocacy to government for its concept. The author is Lesley Eaton, former Victorian Branch and National President, and now President of the Southern Tasmania Branch. 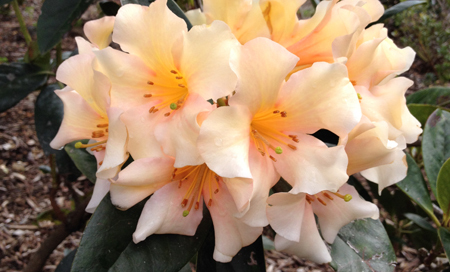 National Secretary Simon Begg has contributed a very interesting article on Vireya rhododendrons, and the importance of husbanding (and expanding as and when possible) the diversity of species in cultivation in Australia, inter alia through placing plants into the care of more individuals so that their continued cultivation here might be the more secure. And Lesley Gillanders of Southern Tasmania Branch has given us a glimpse into her passion for botanic art, featuring rhododendrons, of course.